Scholar and medical doctor, Guohui Liu, presents a new and detailed translation of the Chinese classic Shang Han Lun. He provides a line by line translation of the text with extensive commentary and descriptions of the clinical applications. The book includes the 112 formulas and the 88 medicinal substances. 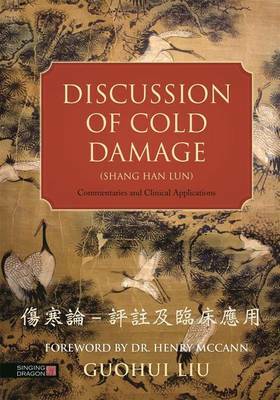 A major new translation of the Chinese classic Shang Han Lun by scholar and medical doctor Guohui Liu makes this foundational text fully accessible to English speaking clinicians for the first time. Extensive study and research underpins the translation; the author's understanding of both classical and modern Chinese enables him to interpret fully the ancient work within the theory of Chinese medicine. An extensive commentary explains the translation, the difficulties with the text, how it has been subsequently translated and expands on the theory laid out in the original text to reach an understanding that can be applied in the clinic for diagnosis and treatment. The value of this classic text lies primarily in its establishment of a basic framework for differentiation and treatment, but it also presents 112 formulas and 88 medicinal substances, which are commonly applied in clinical work for various conditions. In this edition, the 112 formulas are fully explained in the context of the clinical experiences of well-known ancient and modern doctors, and they are also laid out in two appendices, cross referenced to the text.